Pieces of Her by #1 internationally bestselling author Karin Slaughter is an electrifying, provocative, and suspenseful novel unlike anything she’s written before. Georgia native Karin Slaughter first made a name for herself in crime fiction with her beloved, bestselling Will Trent and Grant County series. After some crossover between those sagas, she set her sights on new territory with the Edgar Award-nominated standalone novel, Cop Town (2014); Pretty Girls (2015) and The Good Daughter (2017) followed. Two of those titles are currently in development for film and television, as is the author’s newest release, Pieces of Her. Pieces of Her opens with a short prologue before introducing readers to Andrea (“Andy”) Cooper, a floundering 31-year-old artist moonlighting as a police dispatcher in Belle Isle. Andy and her mother, Laura—a breast cancer survivor who blames herself for her daughter’s relocation from New York City—are at the local, in-mall Rise-n-Dine restaurant to celebrate Andy’s birthday. It’s a relatively innocuous event that nevertheless ends in terror when a gunman opens fire, killing two and injuring others before Laura calmly (and fatally) turns his own weapon against him. The incident is captured on film, becoming the spectacle of the moment, and Andy watches helplessly as her mother—first hailed a hero for her decisive actions—comes under increasing scrutiny from both the authorities and the news media. After refusing further medical treatment and checking herself out of the hospital, Laura insists that Andy pack her belongings and leave the garage apartment she’s been inhabiting since moving back to Georgia. Though baffled, Andy understands that to argue would be futile and instead makes arrangements to temporarily live with her adoptive father, Gordon, a lawyer who remains on friendly terms with Laura despite their divorce. But before she can make her retreat, Andy witnesses an intruder on the property and intervenes. Is this person connected to the mall incident, or did the pervasive news coverage spur on someone from Laura’s past to settle a score? Though the answer isn’t immediately apparent, it factors into Andy’s sense of disconnectedness from her mother, who has become a virtual stranger within the course of one day. Laura dispatches Andy with a set of cryptic instructions, cautioning her not to return to Belle Isle until she’s been contacted directly by cell phone and told that it’s safe to do so. What follows is a literal and figurative journey in which Andy must take charge, relying on her own actions, instincts, and resourcefulness rather than her parents’ well-meaning interference. To say much more would risk spoiling the specifics of the plot, but what can be revealed is that the book is presented in distinct parts that, taken in totality, tell two separate but connected stories. These dual narratives represent the many pieces that Laura and Andy are comprised of individually—and that bond them indelibly as mother and daughter. While the book is a decided departure from her earlier works, Slaughter does explore some familiar themes; among them: finding oneself when seemingly lost, reconciling past and present, and the redemptive powers of truth. Readers may or may not take to the politicized backstory, but it’s absolutely integral to the plot and becomes increasingly immersive as the alternating time periods begin their intricate intertwining. The result is a potent mix of visceral action and psychological suspense that is both thought-provoking and emotionally resonant, evoking sympathy and suspicion for a convoluted cast of characters who exist within equally convoluted circumstances. 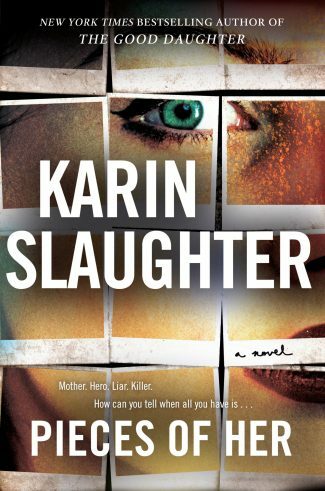 Karin Slaughter has built her brand on defying expectation, and Pieces of Her marks yet another prodigious step forward in that progressive path. Though this book may prove divisive among those who prefer the familiarity of her series fiction, its ambition and scope cannot be denied, nor should it be. In a world where imitation has become routine, Slaughter boldly stands apart, daring us to join her.